Well, it has been a while since we announced the long awaited come back of ours… But it’s never too late to start ;). So here we are with a new Free Project! I was going through some free psds of navigation menus. I found one really good and thought of converting it to a nicely coded CSS/XHTML menu. But I couldn’t stop myself and added a bit of animation using jQuery! Here you can find the demo and the as obvious the download package. All the necessary CSS, JS and XHTML files and image are included in the download package. Feel free if you wish to use this on your projects. Just include the copyright and license things ;). As for the designing, thanks to COREGFX for freely providing us the necessary psd file. I have just added the dropdown into the psd. In the next post I will discuss more about the how the code works. 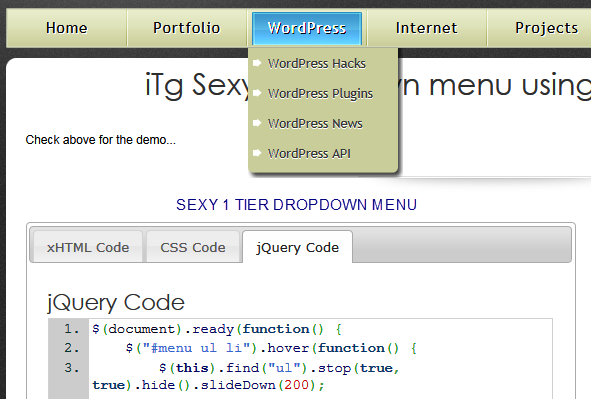 Is this a plug-in for wordpress? how about using this drop down stuff to a standard website? Is it possible? This could be a help to minimize the the space in the menu area. Horizontal stripes make you look thinner and add a little bit more excitement than plain solids.I’m getting one soon and wondering which would look nicer.Thanx. The post is very informative..thanks for sharing this with us. In this first we install the plug-in software after we can learn the all steps which you given above.